If you’re committed to the fitness life (hey, it’s still January — don’t give up on your resolutions just yet), chances are you might have come across ads for Peloton, a stationary bike with a tablet that allows you to take live" spin classes at the tap of a screen. They also make a treadmill that offers live running and bootcamp classes. According to their site’s aspirational copy, Peloton “is here to meet every fitness challenge you set yourself” with a mix of “live cardio and strength workouts to fit your goals,” plus “top NYC instructors” who will teach you based on your schedule. “Welcome to your very own private fitness studio,” it reads. 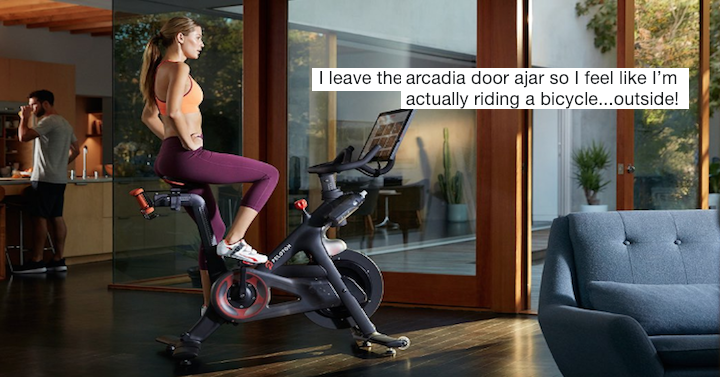 But people are noticing the glamorous imagery in the latest ads for the workout equipment are more than just aspirational — they might be straight-up delusional if we take a close look. 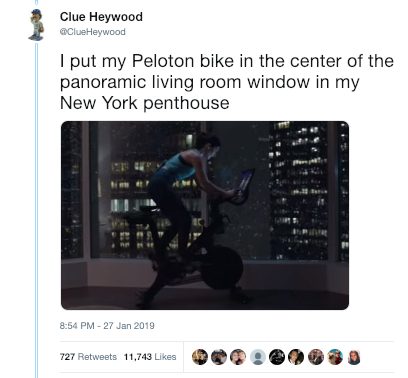 An Arizonan with the Twitter moniker Clue Heywood, who writes “mostly bad jokes” per his Twitter bio, launched into a Twitter tirade about the bike. 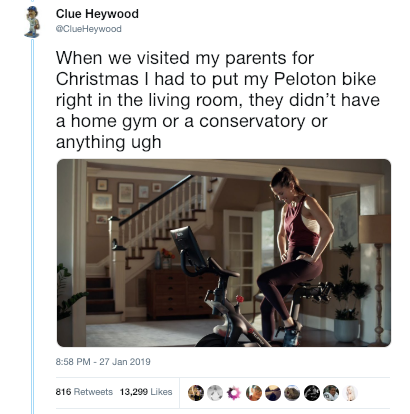 He has amassed over 20,000 retweets for his hilarious satirization of Peloton’s totally serious ads. 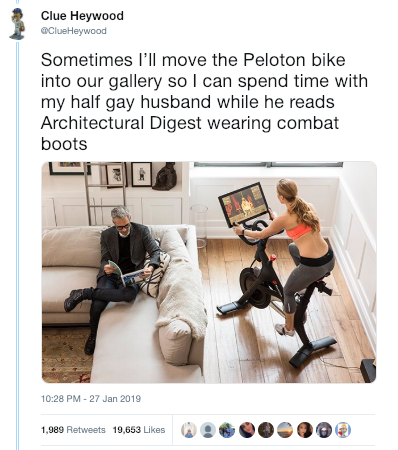 “Love putting my Peloton bike in the most striking area of my ultra-modern $3 million house,” his thread begins. 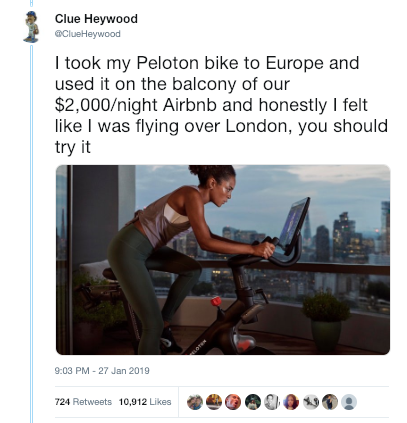 The most impressive thing about Clue’s thread is his undying commitment to unpacking each Peloton product image and writing descriptive copy for every single one. One shows a tired woman struggling to catch her breath on her stationary bike, her hands resting on her hips. Bright and airy sunrooms are also acceptable; as are high rises with big windows, yachts, galleries and the guest houses of Brentwood mansions. 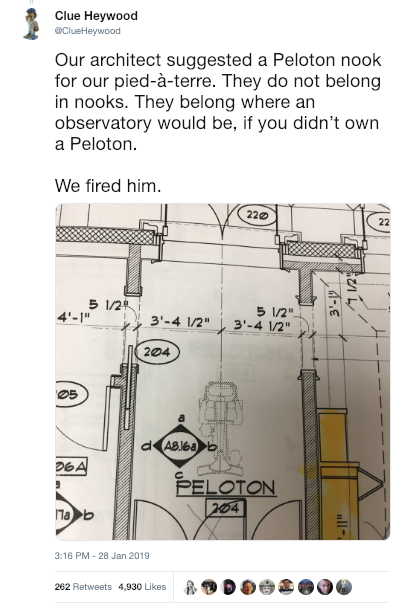 But don’t even condescend to invest in one of these machines if you’re going to insult the Peloton by putting it somewhere less than desirable. 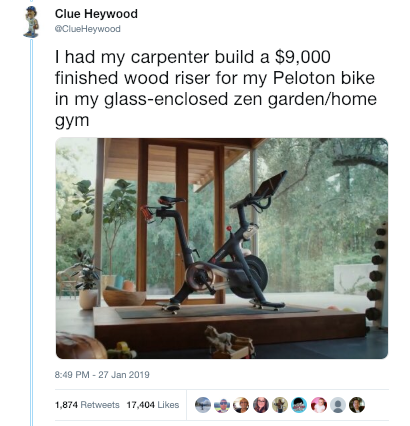 If you’re going to stick your stationary bike anywhere other than “a solarium, conservatory, grotto, inglenook or rumpus room,” just quit while you’re ahead and get a gym membership like the rest of the Plebs. 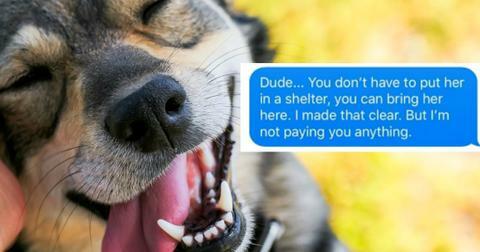 People are dying over this thread, because nothing on the internet is more enjoyable than making fun of the 1 percent. “I didn’t want this thread to end,” commented one of the 20,000 new followers Clue has gained since making it big on Twitter. Other times, when he wants to feel like he’s “actually riding a bicycle...outside!” he’ll move the 135 pounds of carbon steel into the sunroom, where he’ll “leave the arcadia door ajar” for, you know, a fresh breeze. 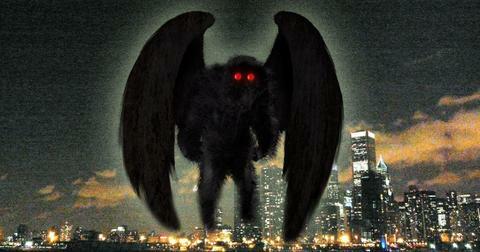 That’s just when he’s staying local, though. Sometimes he’ll pack the whole thing up for a ski trip and ask his servants to stow it away on his private jet. 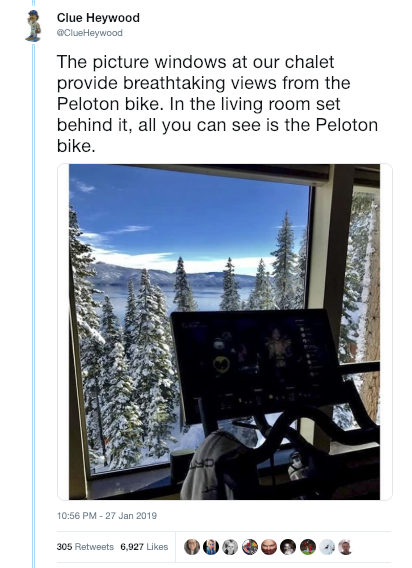 “The picture windows at our chalet provide breathtaking views from the Peloton bike,” he writes about the snowy mountain landscape in the distance. 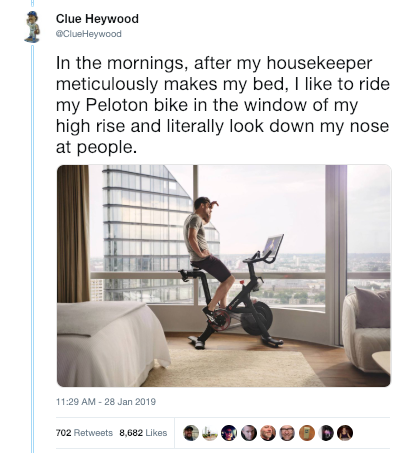 “In the living room set behind it, all you can see is the Peloton bike.” Then he’ll drag the thing back to his Tribeca high rise, obvs, where he can ride the Peloton after his housekeeper “meticulously makes” his bed. That way, he can “literally look down my nose at people” who are walking or (gasp!) riding bikes on the actual streets. These tweets are hilarious individually but even funnier read all together. And Twitter is adoring this thread so much, they can hardly contain their laughter long enough to write back. “I couldn’t squeeze my Peloton in between the Ferrari and the Rolls so I just have Consuela mist me with water so it looks like I’ve broken a sweat,” tweeted one person. Relatable! I’m crying salty tears myself, and now I’m going to have to look into how to finance one of these luxurious exercise machines so I can contemplate life from the back of my Bentley while I pay someone else to sweat in my stead.